I love Christmas. I love the anticipation on my girls’ faces and in their hearts. I love the mess (did I say that? ), the extended family time, and the planning that goes into gift giving (my primary love language). I love the food (of course). I love all my crazy, affectionate family getting together. I love that there is no scheduled time, except girls rising at 4:00 a.m. to unwrap presents. I love looking at all the lights and displays. And I love that for a period of time, in the midst of hyper-consumerism and secularism ― when a man in a red suit is being transported by reindeer through a world full of pain, heartache, challenge, and adversity ― that we get to exalt the name of JESUS. One of my favorite Scriptures in the entire Bible is Luke 2:10, where the angel of the Lord declares Jesus’ birth to the shepherds. From that, we know our message is GOOD NEWS. Our message brings GREAT JOY. Our message is for ALL PEOPLE. Let’s determine to keep a great spirit at Christmas. Let’s make sure that we don’t get cynical or judgmental, but that we actually look like people with good news to tell. We want to spread that news with great joy and not exclude anyone from hearing it. Let’s ensure that our hearts and homes are full of love, joy, peace, kindness, generosity, laughter, warmth, and celebration at this time. Perhaps you have family members or friends who need to be forgiven, embraced, included, and loved… why not determine to make this the year you cross that threshold and make a move toward forgiveness and reconciliation? 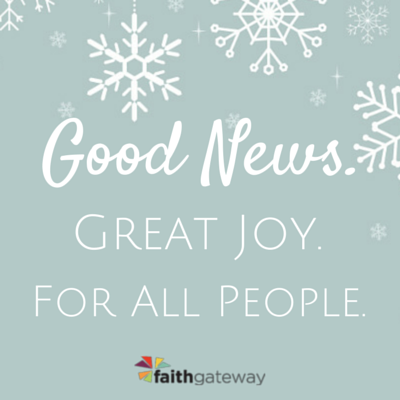 Who in your circle of family and friends needs to hear the good news of great joy? How will you bring them this message? Taken from Living Life Undaunted by Christine Caine Copyright (c) 2014 by Christine Caine. Use by permission of Zondervan.